On the Grow™ classes cover topics and ages well beyond the focus of our traditional signing agenda. On the Grow™ offers fun and exciting classes for parents and children (from birth to age 5) to enjoy together. These short, 45-minute classes include parenting topics from Drs. Acredolo and Goodwyns' two other best-selling parenting books, Baby Hearts and Baby Minds. These interactive classes are based around fun, child-friendly themes while incorporating wonderful child development topics such as self-control and cooperation. Parents are often unaware of the surprising things their baby can already do and how to foster these early abilities. The Baby Mind Time™ class is designed to help parents recognize and enjoy these hidden talents. While interacting with their babies and other families, parents will be introduced to insights and tips from Drs. Acredolo and Goodwyn’s best-selling parenting book, Baby Minds, to help them make the most of these amazing early months. The goal of Rumble Tumble Tummy Time™ is to bring parents and babies together with other families to learn ways to make tummy time fun for babies and easier for parents. Using engaging songs and activities, parents will not only enjoy the classes, but will also get lots of ideas for extending the experience to home. There are 4 classes, each designed to be delivered in a 45-minute session. Take one, take them all, it's up to you! This class was designed to introduce parents to the Baby Signs® Program through an example of a signing play class. Fun songs, stories and activities highlight important developmental skills. The class also provides some wonderful tips and examples of how using sign language with babies and toddlers helps to foster a love of books and early literacy skills. Signs have been included in the class to encourage those families who have not previously enrolled in your classes to consider signing up and to provide an additional option for those families who have completed all the classes you offer. Good manners do more than impress people. They also express gratitude and promote harmonious interactions. Helping children learn these social skills is important because kids who feel grateful and treat others well are more empathic, get along better with peers and adults, and feel more satisfied with life than those who don't. Manners are best taught through example, and mealtime provides many opportunities. Because manners are abstract ideas, including simple signs can make the concepts more concrete for young children. That's the purpose of this class. Additionally, increasing a child's mealtime vocabulary reduces frustration by enabling the child to be more precise in expressing likes and dislikes—resulting in more harmonious mealtimes! Ideal for ages: 18 months to 5 years. This class is designed to provide parents with information to help teach their children about the important skill of "classification" by focusing on the most common differentiating feature—color. Many parents are not aware of how easily this skill can be taught during routine activities. Colors were also chosen as the focus because color names are often requested by families who have taken other signing classes. Toddlers learn through being actively engaged in an activity. What better way to engage them than through music. It doesn't take much encouragement to get children moving when music is playing. This class will help parents and children make the most of this fun stage of development by encouraging exploratory movement through fun games and songs. Parents will also learn how to use music to set a mood and discover how music promotes language, cognitive, social and physical development. Ideal for ages: 18 months to 3 years. This class is designed to teach parents how to foster independence and pride of accomplishment through playtime activities with their children. The songs and activities that you will be leading are designed to encourage both independence and exploration as children learn about the world around them. This class is designed to teach children about cooperation through the theme of transportation. The songs and activities are included to reinforce the skill of working with others. This class is designed to provide parents with information to help teach their children self-control. Many parents are not aware that this is a skill that needs to be taught; rather they try to impose control by using words like "Stop" and "Don't." This class will show parents how to teach the concept of self-control through fun songs, games and activities. Parents often worry about how to help their child adjust to the idea and reality of a new baby in the home. This class is designed to give children fun, developmentally appropriate activities that they can do with the new baby at home. During the class itself, children will play games, sing songs, learn some new signs, read a story, and make a special craft. In addition, parents will receive simple tips to help them promote positive sibling relations when they return home. This class is designed to promote skills that are fundamental to learning to read by introducing parents and children to the ASL signs for the letters of the alphabet through fun songs, games, and craft projects. By providing children with a physical way to represent letters, parents will be helping their children remember the letter names, be able to identify the letters visually, and understand the function of letters to represent the separate sounds within words. The focus on numbers is of particular interest to parents as they begin to think about preschool. Additionally, this class may be of interest to childcare centers as an enrichment program. Children and parents will enjoy a class filled with games, stories, dancing, and activities based around the theme of numbers! Looking for a dynamic workshop designed for infant teachers and early intervention professionals? The Infant Development Workshop is designed to provide teachers concrete activities to use with babies in their care along with the developmental basis for each of the activities. Teachers will explore vision, physical, cognitive and communication development in babies. This 2-3 hour informational workshop is geared toward babysitters/childcare providers 11 years old and up. The class is divided into general developmental groups (infants, toddlers, preschoolers, and school-age children). Fun learning activities and take home projects are included for each group. When participants complete the workshop they will have at least 2 activities per developmental grouping which they can use when babysitting. 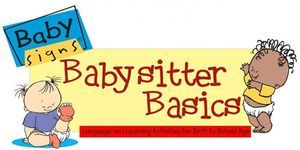 Additionally, participants will learn signs that will be helpful to them when babysitting and will be introduced to how the use of signs supports the development of children. Sign Language for Babies and Children "On The Grow"
Please add me to the interest list for the following ON THE GROW class/classes.